by kindle: Newly tagged products at Amazon.com. by blu-ray: Newly tagged products at Amazon.com. by iphone: Newly tagged products at Amazon.com. RoboForm will create and store user IDs and passwords. A CNET favorite! Proceeds benefit animal rescue. Click now! Save your passwords and sanity. 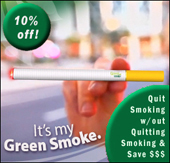 Stop smoking without missing it! You won't believe how good you feel (smell, and taste). You'll save money, too! Full-Body No-Impact WorkOut! Exercise was never this much fun.